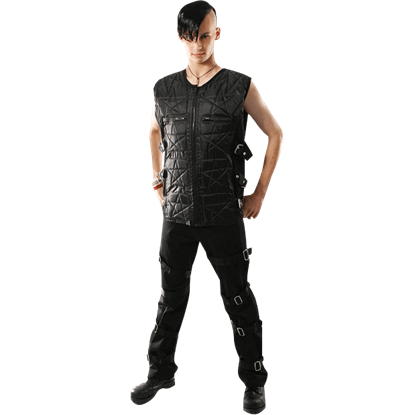 Do you have the right mens legwear to match the gothic style of your gothic shirts? If not, we have you covered with an assortment of gothic pants and black trousers that are sure to be right up your alley. We carry all sorts of gothic trousers and printed cargo shorts that are sure to please your sense of style. Depending on your preferred style of gothic fashion, you may appreciate our gothic punk trousers, mens industrial pants, or rock couture jeans. Many of our gothic pants feature bold graphic prints such as barbed wire, blazing dragon fire, skeletal grim reapers, and more. While these pants are sized for men, many offer a unisex look that even ladies can wear. 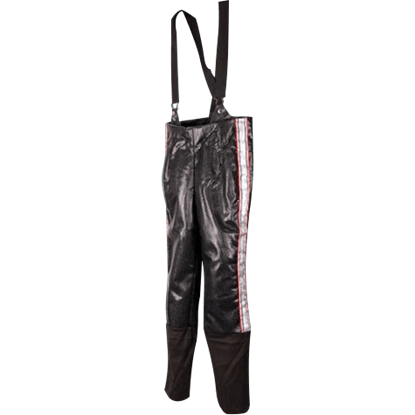 Do not neglect any aspect of your gothic fashion with help from the gothic pants, gothic shorts, and gothic trousers! 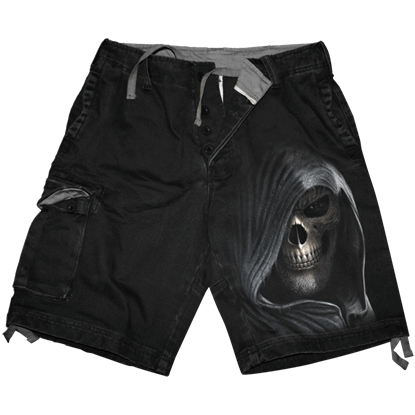 Beware the nights dangers as the Darkness Cargo Shorts pay homage to the Grim Reaper and his unending quest. Eyes ablaze with fiery passion in this Azo-free graphic, the angel of death sets his sights upon the unsuspecting crowd. 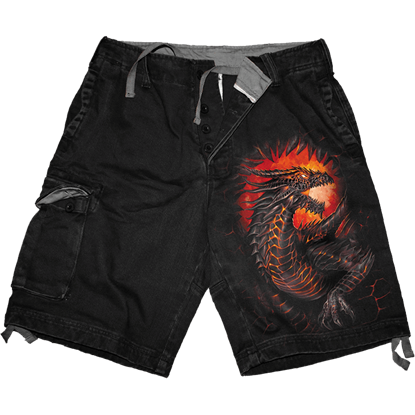 Breaking free from its fiery prison, the dragon on the Dragon Furnace Cargo Shorts is ready for revenge. These shorts are stone washed, dyed with skin friendly dyes, and made from 100 percent cotton denim. 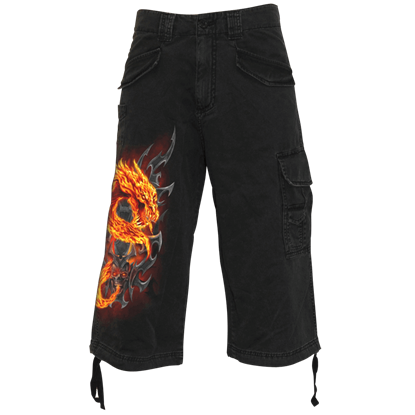 Summoned from beyond the grave, the fiery danger of a long-dead dragon slithers its way out of the engraved tribal skull on these Fire Dragon Long Cargo Shorts. These unique long shorts are a great choice for any Gothic wardrobe. 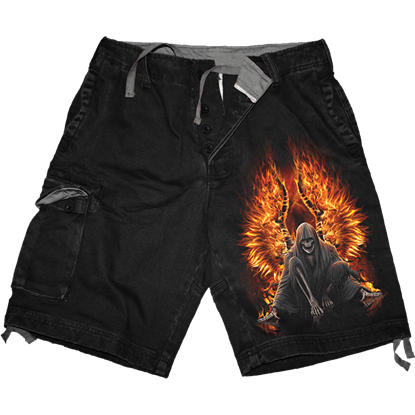 Death has come for another victim in the Flaming Death Cargo Shorts, and with his wings of fire there are few who would protest. These shorts are stone washed, dyed with skin friendly dyes, and made from 100 percent cotton denim. There is a futuristic look to these Gothic Belt Wrapped Trousers, or at least a look that is fashion-forward and post-apocalyptic. That does not stop these pants from being stylish, though, or from working well with many styles. These long black pants suit any number of gothic styles depending on the shirt and accessories they are worn with. The Gothic Black Side-Laced Pants show off crisscrossed lacing down the sides of the legs. When you need a look that is commanding and striking, these long black pants serve well. The Gothic Pirate Officer Pants create a superb look with buttons that run down the outside of the lower half of each leg. These pants make a fantastic piece for fans of gothic attire with their bold look! 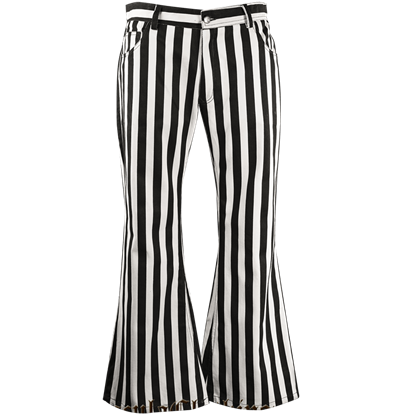 The vertical black and white stripes of the Gothic Striped Pants help to create a slim appearance that looks great with gothic shirts and vests. The fires of hell burn hot indeed. They also make for a blazing accent to add to your own gothic style too. 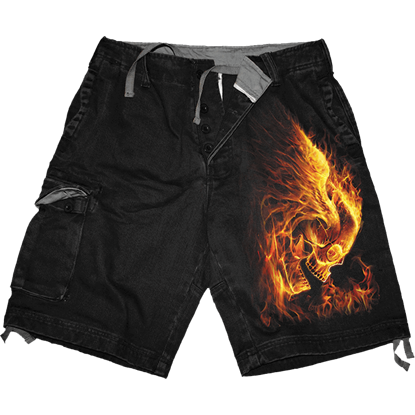 These Hellfire Cargo Shorts harnesses flaming skulls to serve as your own personal decorations. Even the Headless Horsemans pants are ghastly, featuring a style that would send a lesser man running in fear! These Hessian Horseman Pants are modeled after the same attire worn by the Horseman during the film Sleepy Hollow. A fashionable favorite since the 16th century, the Scottish kilt offers a great way for you to enjoy Highland style. 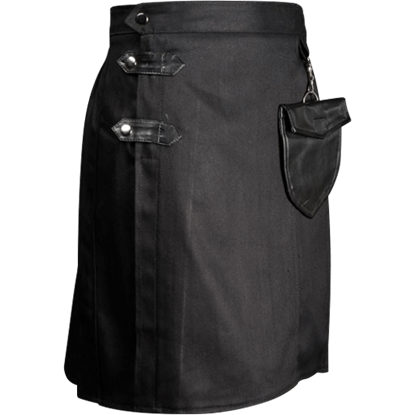 The Modern Black Kilt is a contemporary version of the traditional Scottish garb, perfect for daily wear.